Piebird is a happy place to inspire kindness. We (Sherry & Yan) started Piebird in 2005 as a place of Peace-filled smiles upon the path to Animal Liberation. 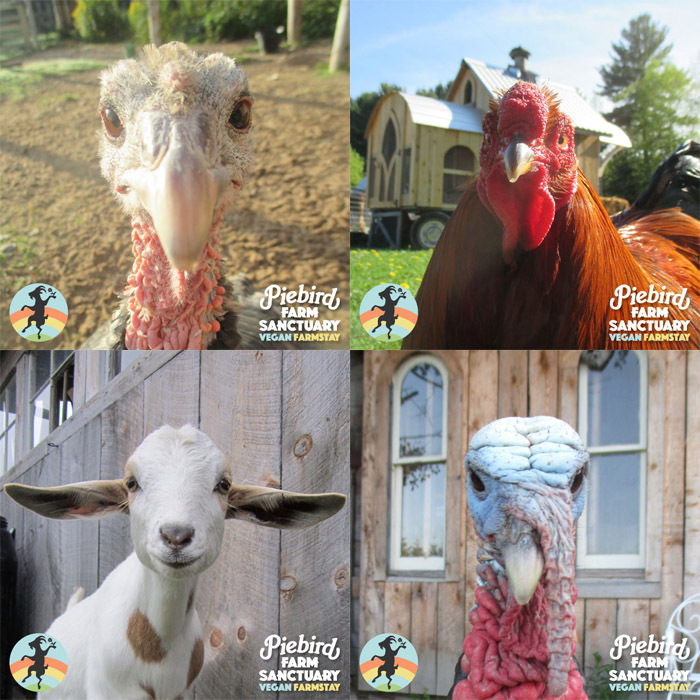 As a sanctuary, 29 feathered and four-legged friends call Piebird their loving home. As a sanctuary, we dedicate our lives to their lives. As a sanctuary, we dedicate our lives to Animal Liberation — because simply, liberty lives in every heart. Animal Liberation is as essential as every other liberty. If we are not all free, then none of us will ever be. As a sanctuary we advocate for Animal Liberation, Veganism, and love! As a small seed co, this fertile soil here breathes inspiration into the heartbeats of gardeners everywhere. Feel that rousing in the roots? Feel that roaring in the heart? These seeds support sanctuary and inspire love! At Piebird Farm Sanctuary, we provide loving, lifetime sanctuary to those we can reach, so that they can live their lives in a peaceful home where they can play, explore, be cherished, loved and properly cared for — like all sentient beings should, regardless of species, age, gender or breed. Donations and sponsorships are always appreciated to help support the sanctuary work we do here. Donations directly support feeding, health care, 24 hour care of new intakes, as well as our outreach advocacy & sanctuary expansion.